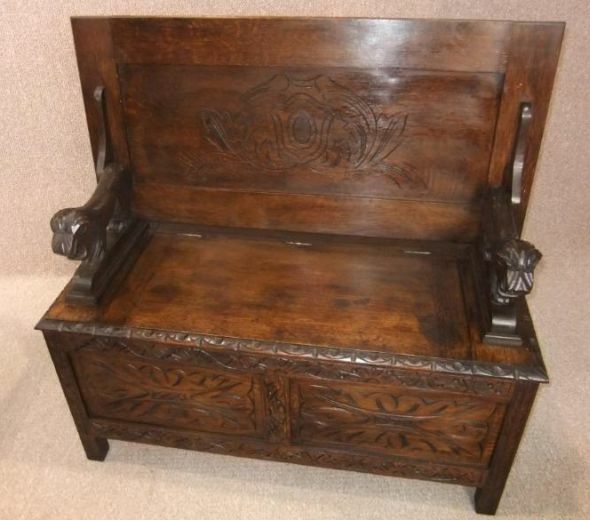 A decoratively carved circa 1920s oak monks bench. This piece features a traditional lift up back, so it can be turned into a useful bench or side table. It also features a lift up seat giving a large storage space for boots, shoes etc. The item is in fair condition for its age, and has recently been removed from a local house clearance. As you can see from the photographs, it does have some old ring marks and signs of wear and tear which is to be expected from pieces of this age. It is still an extremely useful and sturdy piece of furniture; ideal for any hallway.